Yeah, I really don’t like UGA….. But…..
As a graduate of Georgia Tech, it is instilled in me not to like UGA. From the liberal academics to the overrated football team, I just don’t like them. But even this Yellow Jacket will have to admit it when something good comes from that school. Hawkinsville / Pulaski County is one of only a few ARCHWAY PARTNERSHIP COMMUNITIES within the state of Georgia. The Archway Partnership is a program of the University System that aspires to help communities solve problems, reach goals, and do transformative work by allocating the resources of the University System and partnering to help the communities utilize their own resources as well. The program is a win-win for all involved. The Communities get resources that would otherwise not be feasible from either a logistical or a financial limitation. The University gets to provide students with real-life opportunities to better education and train them. The students get to do important work to show to future potential employers. We have been involved in the Archway Partnership for over 5 years now and the benefits are real and noticeable. In the area of Leadership, Archway has led an adult leadership program that has now trained over 200 residents and got them involved in all aspects of our community. The adult leadership program has been such a success, that they are now self-sustaining with their own 501-C3 organization. In addition to training, each year’s group does a community project that does GOOD within our town. From providing protective armor to our Sheriff’s department, to providing defibrillators to community venues, to providing rural water pumping equipment to our fire department, to providing trash cans to our downtown and much more. The leadership initiative also includes a youth leadership component that is providing insight to community concerns as well as getting feedback from this demographic as we seek to improve our community. In the area of Economic Development, Archway has helped with many RFP (Request for Proposals) that different companies or the state of Georgia sends out to highlight what our community has to offer to potential businesses or industries. Also under the heading of Development, Archway has been instrumental in helping revitalize our downtown. From Beautification efforts (through developing a Master Gardner’s program) to helping develop a Downtown Merchant’s Association, Archway has led the efforts. Archway is a vital partner (with our Family Connections Program) in bringing the TEEN MAZE to our schools every other year. TEEN MAZE provides a gaming environment where students are presented with real life situations that often complicate their expected path to graduation. Over 200 volunteers (from our community of slightly over 10,000 people) help make this event a rousing success. Archway helped grow a local at-risk teenager program – Life League. Life League is now in multiple counties and strives to teach at-risk students real life situational events such as How to perform in an interview, How to tie a tie, why work-ethics and being on time are important. While using basketball to attract the young people, real education is being conducted. Archway has brought the resources of the Pharmacy School of UGA to help our local Hospital research problem areas such as why people are not taking their medicines as prescribed. They have helped our hospital with IRS requirements to keep / prove their non-profit status. Archway has helped with the city / county relationships by being an unbiased middle man. They provide a safe non partial environment to iron out differences in tax equity and service delivery areas. So much so, that now Hawkinsville and Pulaski county have served as models for other communities on city-county relations. They have helped us rebrand ourselves and helped design a new website to promote the new brand. Archway has helped with Design Charets, signage design and placement, and more from the college of Environmental design. Archway has even helped area businesses such as Hardy Farms look at ways to promote Agri-Tourism. They are helping Lamar Pecans develop a Pecan Cracking machine. The reason I am writing this post is that I am currently attending the annual Archway summit at UGA. The Summit allows us to interact with other Archway Communities so that we can see their best practices and understand what has worked for other communities. It also allows us to see “behind the curtain” to the staff and students behind the Archway Partnership. I sometimes just think that our own Michelle Elliott (our local Archway Professional) is the magical OZ that gets it all done. The summit allows me to see the people backing up Michelle to pull off these extraordinary efforts. 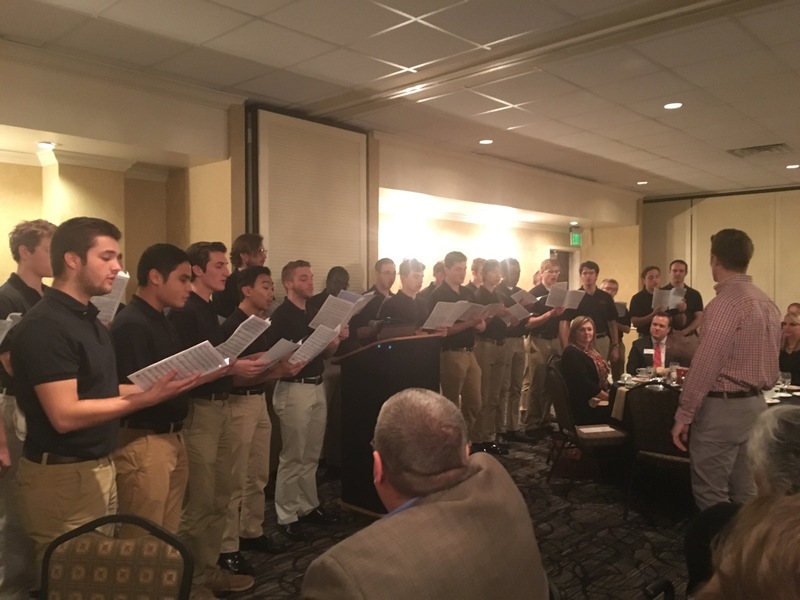 The picture below is the UGA Men’s choir entertaining us at the summit. Except for the UGA fight song, they were pretty good. 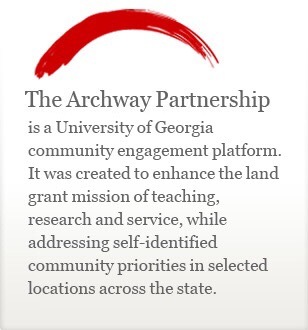 So, while I still don’t like UGA, I’ll have to admit, the Archway Partnership is a great program. Even UGA gets it right occasionally. Posted on February 9, 2016, in Hawkinsville Posts and tagged Archway, Hawkinsville, Pulaski, UGA. Bookmark the permalink. Leave a comment.